This natural supplement can help. Excellent product for cats and dogs with kidney disease and chronic renal failure--CRF. Fabulous product to flush out toxins accumulated in the kidneys and overall body. Helps to increase your pet's overall sense of well being. This is an excellent product to use for any cat or dog exposed to toxic substances and/or experienced problems resulting from the pet food recall!! We have hundreds of testimonials--this product is a must-have for any dog or cat with kidney disease. This product helps pets feel better ranging from CRF cats who stop vomitting to increased mobility in older dogs with back pain due to referred pain from the kidneys. It is also an EXCELLENT product for any pet with liver or heart issues as it helps to clear out toxins from the body. Renelix is also very easy to use--you can either mix into "soupy food" or syringe into your pet's mouth. Overall, increases energy as the toxins are flushed from the body. Renelix kidney formula drops are indicated for kidney disease, urinary tract infections, heart conditions and improving kidney and lymphatic drainage. This powerful formula will help detoxify your pet's kidneys. Also very helpful for pets with urinary incontinence! Large bottle---will last a LONG time---excellent value. Renelix is also very helpful for cats and dogs with bladder stones and urinary crystals. It is gentle enough to be used with tiny yorkies and small pets. We have countless testimonials from clients who use this product and follow our diet protocols (available by consultation) and then retest their pet's urine and the crystals are no longer present. Lymphatic drainage of toxins is dependent upon good kidney function. This homeopathic remedy helps the kidneys to excrete toxins deposited in the kidney cells and helps to restore normal kidney function. Renelix is very helpful for any type of detoxification protocol, as it helps to flush out toxins. 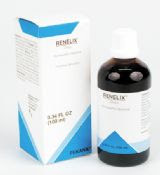 Since other organs such as the liver and pancreas must compensate for renal insufficiency -- leading to a chain reaction that can produce coronary weakness and hypertension -- aggressive treatment with Renelix drops is extremely helpful. Renelix is a soothing gentle remedy that would be especially helpful for older pets, especially those with renal insufficiency.